Skinboat Journal: Why not King Island? 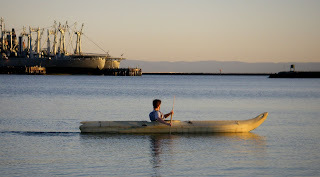 After I built my first King Island style kayak a few years ago, I realized that it had quite a few good features and would no doubt be a good boat for kayak replicators to build. However, the boat did not have any kind of reputation and people weren't building too many of the King Island or for that matter, any other of the Bering sea kayaks. I was going to write something about this at the time but didn't. Then I got a call from Dave Wilhelm who makes King Island kayaks and we talked about how this kayak type is under-appreciated. You can read about Dave's appraisal of the virtues of this kayak by following the link. Meanwhile, I will give you my theory of why some kayaks are more appreciated than others. The reason is really quite simple. The Unangan kayak, or baidarka has a larger following than most of the Bering Sea kayaks because George Dyson's book, Baidarka did a lot to propagandize it. George provides a lot of quotes from explorers who when first encountering these kayaks were impressed by their excellent performance. Nobody has done this kind of promotion for the other kinds of Alaskan kayaks. David Zimmerly published the book Qajaq which shows plans for a number of Alaskan kayaks and he also did a book on the Hooper Bay kayak but unlike George Dyson, Zimmerly never did the kind of sales job that George Dyson did. And so, these boats remain underappreciated. But some of the lack of Bering Sea kayak replication is also practical. Bering Sea kayaks are large volume kayaks made for carrying up to 900 pounds of gear. Most recreational kayakers do not need this kind of cargo capacity and the extra volume makes for a slower boat than one built to be paddled empty. Of course, the Bering Sea designs can be scaled down for recreational use, something that few people have done although Dave Wilhelm has moved in that direction and Skip Snaith and Sean Gallagher have as well and their efforts will no doubt popularize the type and put more of them out on the water. For me, in my late 60s, Bering sea kayaks' appeal has a lot to do with space and comfort. Wriggle room helps to stop me stiffening up. The bigger kayaks also allow paddling from a kneeling position which I find much easier on the back than sitting with legs straight out. Alternating between single and double-bladed paddles also helps to ease tendon problems in the hands and wrists. They have a lot going for them if you don't enjoy being restricted. Lots of room for camping gear as well.